When University of Kentucky students signed up for the MCL 591: Russian Radio class, they didn’t realize they would be reaching people 5,000 miles away. Dedicated to the improvement of students’ linguistic and cultural knowledge, “Russian Radio” is a unique class offered by the UK College of Arts and Sciences. It is not a typical class, however. Instead of taking exams and conducting research, students in Russian Radio learn through live readings on UK’s independent student radio, WRFL-FM (88.1). “We don’t have exams in this class. Every week is like an exam when students try to read on the radio. 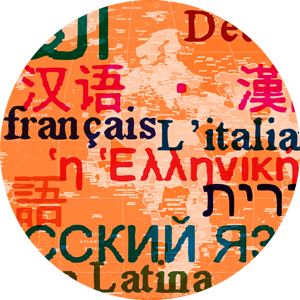 This extra time is dedicated to a student’s deeper understanding of language, culture and connection to Russian,” said Anna Viktorovna Voskresensky, a lecturer in the Department of Modern Classical Languages, Literatures and Cultures (MCLLC) and creator of the Russian Radio class. “This creative, hands-on language learning technique improves pronunciation, vocabulary, reading and listening skills,” she said. During class time, students read literature in Russian from all over the world. From famous poems to lighthearted fairy tales, the class eclipses all genres of literature from various countries. Voskresensky chooses the material to read on-air, holds an individual practice with each student, then meets with students as a group to prepare them to read on-air. Students translate the material from Russian to English, making the show relevant to English speakers as well. This process gives students the ability to read in Russian throughout the week for extra practice. After students master the literature, they are expected to record themselves each week. Students then reflect on progress in pronunciation as well as have material for their graduation portfolio. The class serves as a constant motivator for students to overcome the difficulties in learning Russian. “I find the class helpful because I always have difficulty in pronouncing unfamiliar words and making syllables flow smoothly from one to the other. This class gives me valuable practice in speaking and overcoming such difficulties,” said Mark Hoskins, a Donovan Fellow taking the class. Russian Radio also serves Lexington. There are individuals within the Russian community of Lexington who religiously listen to the show, such as longtime listener and Belarus native Tatsiana Mcgee. Though the Russian Radio program helps the Russian community in Lexington feel at home, several people living in Russia, Belarus and Ukraine also stay up late to listen to the show. 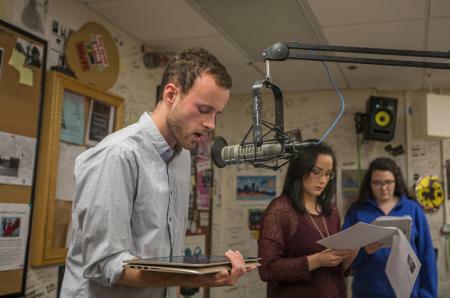 This semester marks the sixth season of Russian Radio, and the students taking the class this semester have read on-air more than 80 pieces of literature in Russian since the class began in August. With many more seasons and stories to come, Russian Radio will continue to serve students, the community and people abroad. Most of all, Russian Radio will continue connecting people through culture, language and literature. “Russian Radio serves as a bridge between people and their homeland. It is a connection between people and culture,” Voskresensky said. Russian Radio airs every Thursday with a wide variety of Russian music chosen by MCLLC senior and Russian Radio DJ Pamela Hammond. Students read on-air 5-6 p.m., on WRFL-FM (88.1).